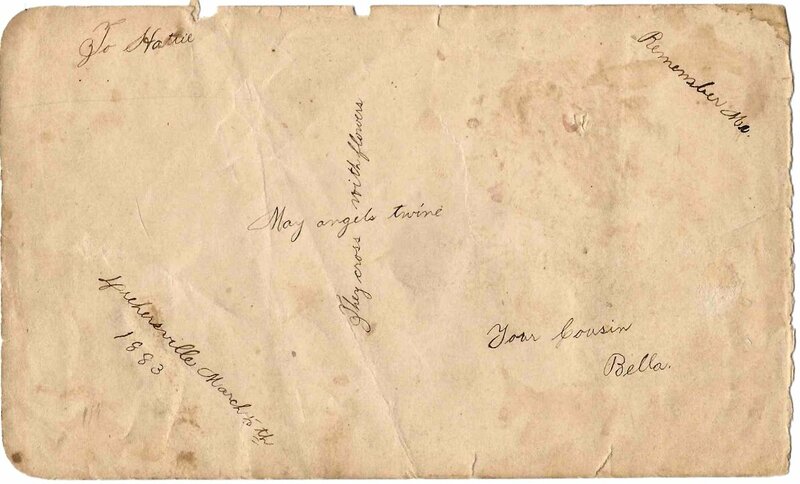 1880s autograph album of Harietta "Hattie" Kindt of Drehersville, Pennsylvania. The album's front cover is missing. 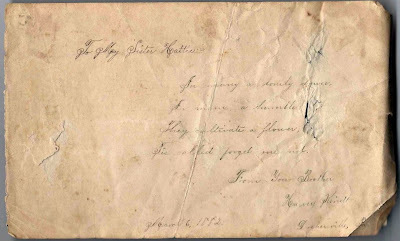 The image above is of the page that Hattie's brother Nathan Wesley Kindt signed at West Brunswick, Pennsylvania, on 20 February 1882. The album is approximately 7" x 4" and may be missing some pages, in addition to the lost front cover. There are 40 pages signed by Hattie's relatives and friends. An alphabetical list of the signers appears at the end of this post. 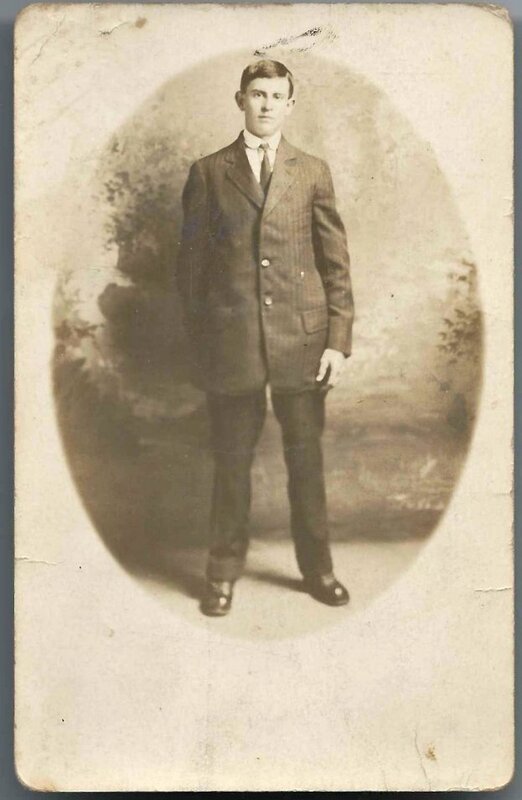 There's also a real photo postcard enclosed, with a young man identified as perhaps Uncle Andie. 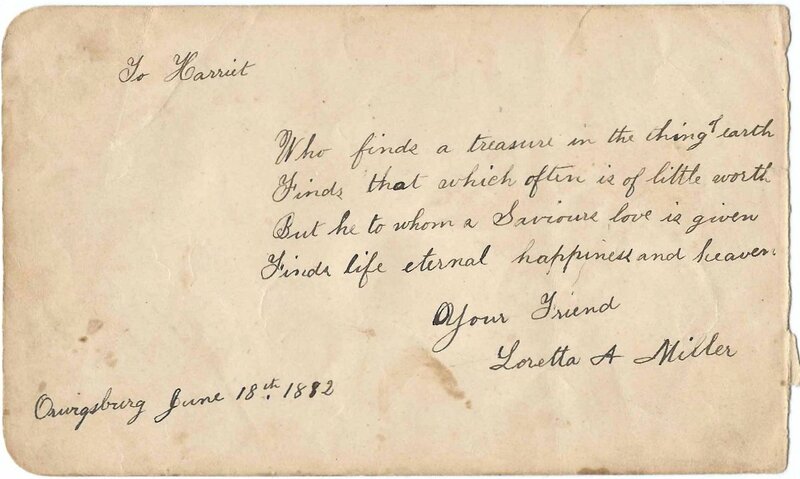 The postcard was originally intended to be given to Edna Noecker. Perhaps a reader will be able to identify the young man from the clues or from family albums. Harietta Kindt was born about 1858, the daughter of Nathan E. and Catharine (Miller) Kindt. Nathan's obituary in the Kutztown Patriot issue of 22 July 1899 mentioned that he was born at Maidencreek, Pennsylvania. He later moved to Drehersville, Pennsylvania and went into the "store business". Nathan's obituary, published in 1899, indicated that Harietta had married George Kramer. Hopefully the spelling of Harietta in the obituary is correct. She could have been Harriet or Harrietta. 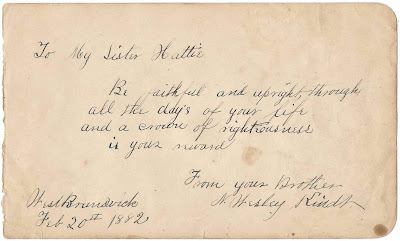 In addition to Hattie's brother Nathan Wesley Kindt, who signed the page at top, three of her other siblings signed pages. 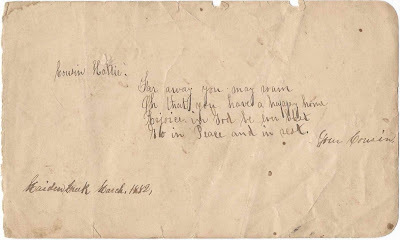 Harvey Kindt of Drehersville, Pennsylvania, signed a page on 6 March 1882. Alice S. Kindt signed a page at Drehersville, Pennsylvania, on 6 March 1882. 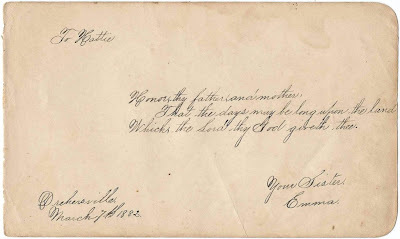 Emma Kindt signed a page at Drehersville, Pennsylvania, on 7 March 1882. Two of Hattie's cousins signed pages, but did not give their surnames. 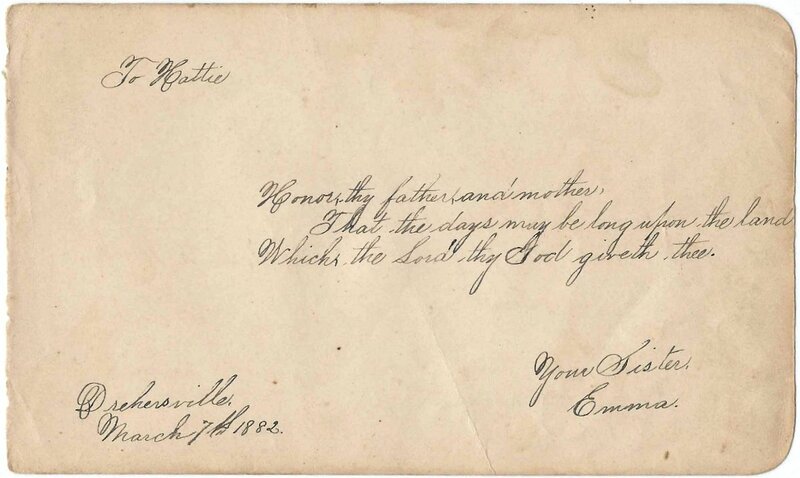 Cousin Bella signed a page at Drehersville, Pennsylvania, on 5 March 1883. 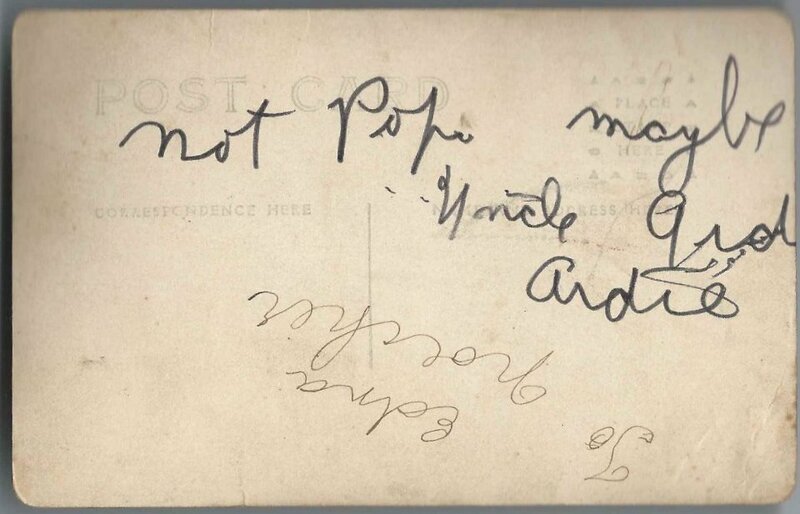 Another cousin signed a page at Maidencreek, Pennsylvania, in March 1882. Since Hattie's father was born at Maidencreek, perhaps this cousin is from his line. Several people with the surname of Miller signed pages. They could have been relatives of Hattie through her mother's line. See the list below for their names. 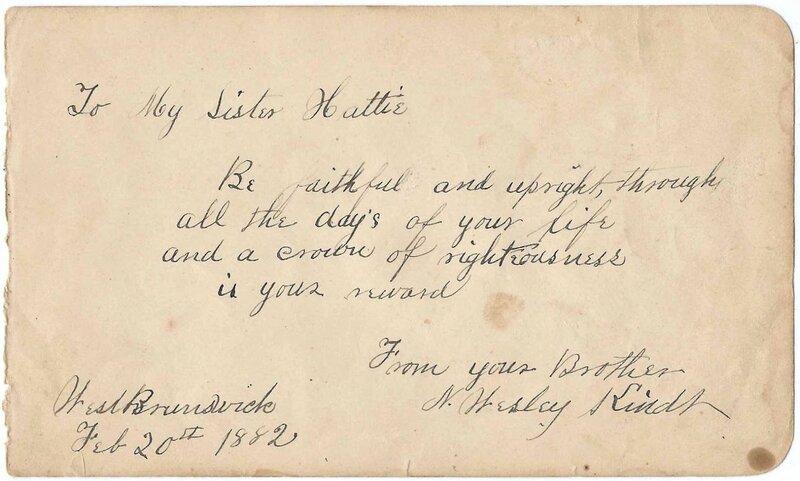 The future wife of Hattie's brother Nathan Wesley Kindt signed a page. 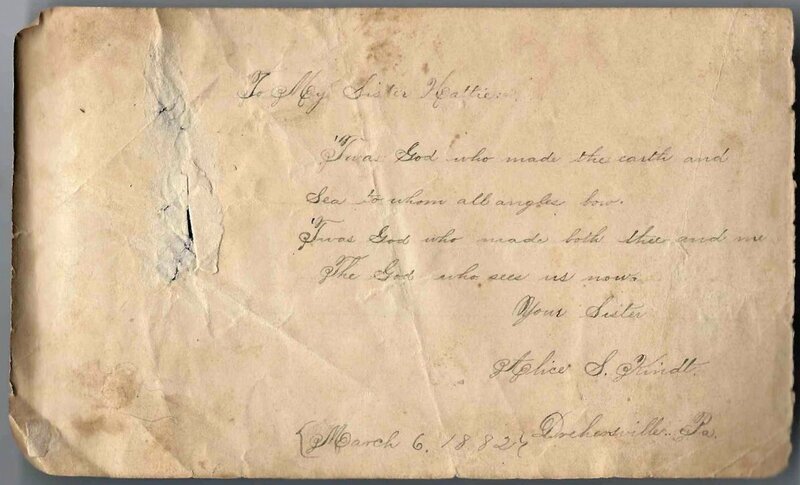 She was Loretta A. Miller, who signed at Orwigsburg, Pennsylvania, on 21 March 1884. 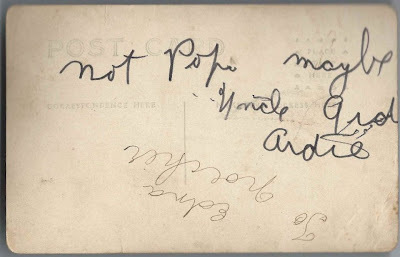 Agnes D., signed in 1882. The surname is very hard to read but might start with Hafe*. 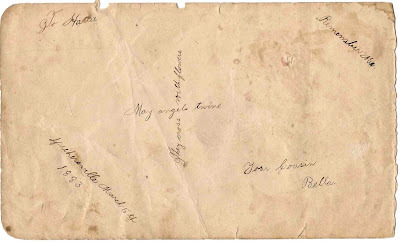 The residence was likely written on the part of the page that has been torn off. Ida A. Honsburger, signed in 1882. Torn page, with only the last syllable of her residence and the year present. "*burg, Pa", was likely Orwigsburg, Pennsylvania. 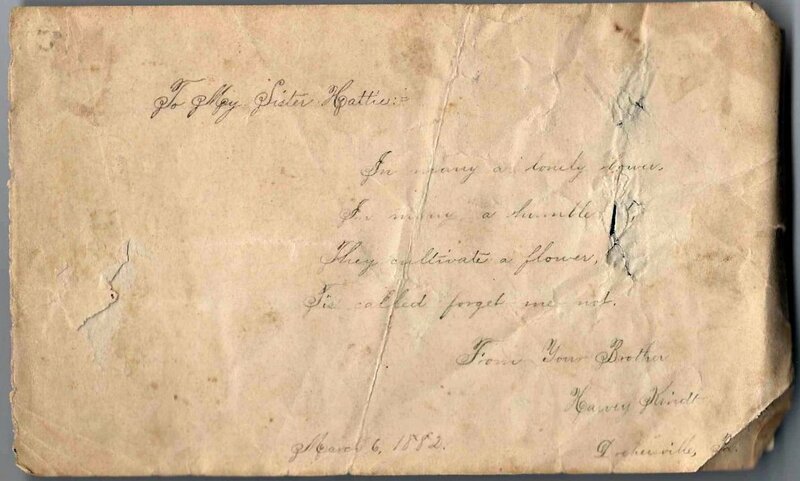 Lenora V. Kimmel, signed at Orwigsburg, Pennsylvania, on 18 February 1882. Not sure of first name or middle initial.